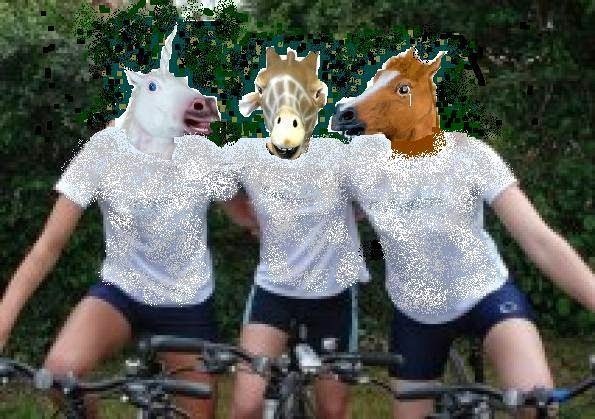 My friend, who is clearly a Photoshop wizard, created this image masterpiece to commemorate an upcoming bike trip. I am the unicorn. So lifelike. Yesterday our dog Charlie was (finally) neutered. He has been wearing the cone of shame to keep him from bothering his stitches. Apparently the cone of shame is heavier than its thin plastic frame would suggest as he walks with it scraping the ground as if the weight of it is too much for his neck muscles to bear. I can tell he wants to communicate his distress to me by the way he whined the entire night long. Yes, the entire night long. Until we took the cone off this morning. Now he is sleeping peacefully in the morning light. This morning my son saw a large animal step into the woods about <this> tall with a long tail, wolf-like head, and it was skin colored. I'm pretty sure he saw a coyote and it's more worrisome to me that we have another coyote in our yard (what with all our chickens and ducks and small children) than the possibility of some kind of were-creature, but I wonder how I'll feel when the next full moon comes about. I woke up craving avocado on toast. Alas, we have no avocados. And now nothing else will do. Does that ever happen to you? I had brunch with ex-poet laureate Billy Collins yesterday at the local college. Listening to him read his poems was one of the most enjoyable things I have done in recent memory. A friend of mine said that she envied that I could understand poetry, that it was all a lot of gobbledygook to her. That made me think and I realize that I may not be getting the full meaning of the written word, but that it doesn't make it any less enjoyable for me. Ignorance is bliss? I think the same applies to visual art. I can look at a piece without knowing the maker's intent and enjoy it all the same. If I later learn what the artist was trying to say, it allows me to enjoy it in a different way. What does that mean? I don't know, this is a random post after all. I'm teaching a needle-felting class tomorrow night and I'm so eager to do it. I hope they enjoy it as much as I do. Also, choosing what snacks to make is more nerve-wracking than planning the lesson plan. I've been thinking about something my grandpa says - "It's easier to pull a rope than to push a rope." But what if you can't get people to come along with you even when you're leading the way? Is it okay to make a lasso and drag them with the rope? I have many, many things I need to finish today. Funny how deadlines seem to crop up all on the same day like that. Coffee, take me away. Time to start the day. I hope you all have a great mid-week. Goose and I are featured on the Kanelstrand blog today. If you don't know Sonya's blog, you should definitely stop by and have a read. She's a great source for ideas on living a simple, meaningful, healthy life, and a talented photographer to boot. I have to share something that I'm working on as part of my day job as Director of The Crossing Arts Alliance, a non-profit in Brainerd, MN. I'm so excited by this project that this might get a little long, sorry. For several months, some of our members have been volunteering in the local jail, teaching art and writing skills to the inmates. I know it's been incredibly rewarding for the volunteers and given the response from the inmates, I'd say it's been equally so for them. Part of the scope of the project is to compile a book that features the work of the inmates. They're excited about this, that they'll have work in a book. That's a big deal for anybody, I think, and especially for some of those folks who haven't had much in the way of positive recognition. They'll each receive a book of their own to show off to friends and family, and then we'll be selling some in our Sales Gallery. The other part of this project is that we are doing an exhibit using the art and writing from the inmates coupled with art from the community. How it works is this...we have asked the visual artists in our community to choose a piece of inmate writing that speaks to them and create a companion visual art piece to it. Writers are asked to choose a piece of visual art, and write. All of these pieces will be on exhibit, side by side, in the jail for the inmates to view, and then in our gallery. Talk about goosebumpy. The idea of community members reaching out and connecting with people they don't know, people from different walks of life and circumstances, is a powerful thing. If we all made a habit to try to understand or connect with others, even a little bit, imagine how our world might change. Goosebumpy, I tell ya. I chose my piece this week, a writing about a crumpled leaf that found its way into the jail. The inmates watched for this leaf, this interloper from outside the walls, for weeks as it was kicked along the halls. It spoke to me so strongly, imagining how meaningful a crumpled brown leaf might be if I were separated from nature for too long. We try to realistic about what our long-term impact will be on these folks, but we can't help but hope that maybe one, just one, will find something in the arts that makes them want to make a positive change in their life. I think I can honestly say this project has made a change in mine. What kinds of rewarding projects have you been involved with? Or what are your local arts non-profits doing? I'd love to hear. A wee mouse is peeking out of his hole beneath the boletes. A piece I'm making for a fundraiser for a local charity. I just need to finish up a few details and the wood base. Almost done. As always, this piece is made of solid wool by means of a felting needle. No gluing, no structural sewing, just poking wool a gajillion times with a barbed needle until it tangles into a shape I like. It's a good thing the Easter bunny is an early riser because the Jordan kids (except the teenager, of course) were up and ready to find eggs at 5:45. These cheesecake-filled eggs are still safe in the fridge. For now. For those that celebrate, Happy Easter. As I mentioned yesterday, I'll be teaching a felting workshop. 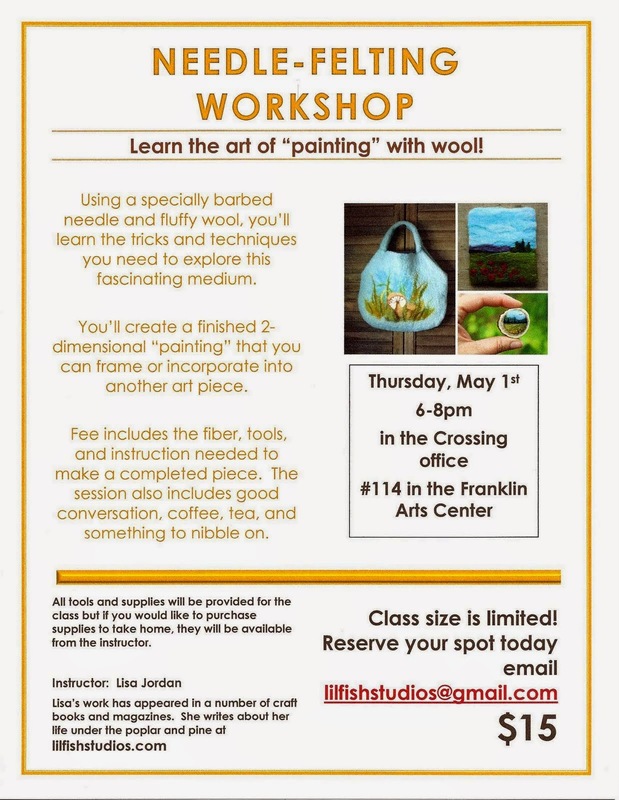 This will be a beginner class focusing on the basics of "painting" with wool and felting needles. It should be fun. It will be held in Brainerd, MN so if any of you locals would like to come out, email me and I'll reserve a spot for you. The cost is only $15 and covers all materials costs to make a small "painting". I'll be holding a felting workshop in a few weeks, teaching some simple wool "painting" techniques. My last felting class was cancelled due to weather so while I was working up this little example last night I was ignoring the 8 new inches of snow on my porch. I refused to look. Kind of the visual equivalent of sticking my fingers in my ears and saying "lalala I can't hear you!" Surely, by May we'll have spring. 'Til then, I have flower-filled meadows on my table. As someone who strives to live a life steeped in nature, I was curious when Marcie offered to give me a copy of her new book, This Book Was A Tree, to review. "Ideas, adventures, and inspiration for rediscovering the natural world" sounded right up my alley, though I wondered if I might not know this stuff already. I mean, I do pride myself on being in tune with nature, and a bit of a nature nerd, after all. Well, I needn't have worried about that. Not only does Marcie provide projects and challenges for getting us closer to nature, she provides a very important component, the "why". After browsing the book, the kids and I decided to make a nesting material ball. The book told us how to do it, but also "why". It helped us understand the intricacies of nest-building and got us to think about what feathered friends live in our neighborhood. She encouraged us listen to the birds and gave us tips on identifying them by their songs. She also suggested how we might apply what birds already know about constructing a simple home, to our own lives. I like that this book has something for people of all ages. My young kids will enjoy the fun projects- the pinhole camera, the sundial, locating Fibonacci sequences, my teenager could appreciate the science behind these projects, and I appreciate that the book encourages a thoughtful application of these projects and ideas to one's own life. We hung our nesting ball in the plum outside our kitchen window where we can watch our feathered friends who come to visit it, and where it will serve as a daily reminder for me as to what goes into my own nest. I have the feeling this is a book I'll refer to often. And if you'd like to purchase a copy of your own, click HERE. I took a class yesterday in which I carved stamps and experimented with them on paper with layers of acrylic paint. It was a change of pace, and though I'm clearly no expert on stamp-carving, it was a fun way to spend a few hours on a Saturday. It's good to try new things, don't you think? My old friend Insomnia stopped by last night. He was invited in by Charlie the dog who decided that he needed to whine to go outside and stand on the porch, doing nothing, at 3am. At 3am. Did I mention 3am? Insomnia hangs around with our other friend Worry, and wouldn't you know, he had to dominate the visit as usual. It's one thing to have a visit with Insomnia but then there's Worry yapping away all night. Thankfully Worry tends to be a night owl, and mostly wanders off once the clarity of day arrives. I think he knows that once day hits I'm going to get up and do something about his chatter. All that visiting has me feeling a little puny today so I'm planning on an extra cup of coffee and a hearty breakfast. I've already been out to the coop and gathered eggs. The act alone lifts my spirits, but so will their golden goodness on my plate. I have a pile of green stones in my bowl right now, in a variety of sizes. I'm planning to do a study in green, an homage to the grass that is starting to push through, the awakening of the earth. I'm looking forward to seeing all those green stones together. If any of you would like to have all those green stones together once they're stitched, email me: (lilfishstudios(at)gmail(dot)com with an offer. Otherwise, they'll likely be sold individually once completed. Well, up and at 'em. I hope you all have an energetic day. I needed some nests to decorate with in the sales gallery at work so I channeled my inner robin and made some of out of wool and twigs. The grasses might still be buried under snow, but there is always a supply of wool and twigs around. Have a cozy week, all. What an arts-filled week I've had. Aside from my day job with an arts non-profit, and my usual stone-making, I had the opportunity to take a felting workshop from the Textile Center, attend a wonderful event at Great River Arts in Little Falls, and celebrate local artist Greg Rosenberg, whose amazing agate lamps and stained glass now grace our local library. Next week I'll help hang the artwork of schoolchildren in our gallery, attend a class with my kids where they'll paint cool fish, and then attend a block printing class by Carla Benjamin. My life is not all art, of course, but it certainly is a wonderful part of it. Have a great weekend all. I hope art finds you too. Those smallish/middlin' sized stones I've been working on are now in the shop, in grab bag style. By listing them as a grab bag, and not having to photograph and create a listing for each individual stone, I'm able to offer them at a lower price. So, if you're purchasing, you won't get to choose your specific stone but I hope the right stone chooses you. Minnesota spring weather cancelled my felting class last night with its freezing rain and snow which meant I was left with a batch of strawberries stuffed with goat cheese and drizzled with balsamic glaze, hummus and carrots, and a big bowl of caprese salad. The kids ate the entire plate of strawberries in about 2 minutes and the salad didn't last much longer. We're troopers like that. Hitting that problem head on. I'll be scheduling felting classes which will be open to the public. I know most of you are far away, but if any local friends would like to take part, I'd be thrilled to have you. I'll post details as they're available. It's time for me to head out into the snow. Have a good day, all.